Pictured From left to right: Charlie Davis, Quintin Cole and Curtis Tarver II. 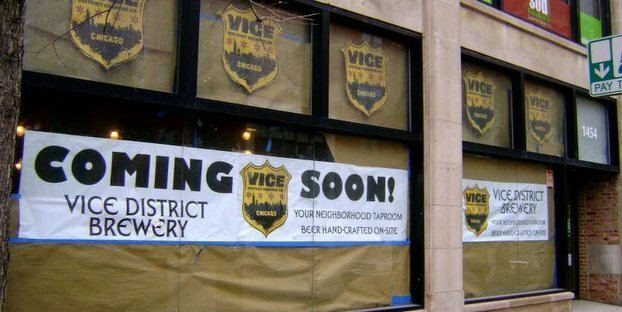 As the brewery and taproom nears completion, Vice District Brewing Co. revealed the identity of its mystery brewmaster – Charlie Davis. “We wanted to find someone that complemented the passion and creativity that Curtis and I bring to the brewing process,” said Co-owner, Quintin Cole. Most recently, Davis was the head brewer at North High Brewing in Columbus, Ohio, but he’s no foreigner to Chicago. He has actually influenced many of the beers you’ll find on tap throughout the city. Most notably, Finch’s Secret Stache Stout, a Gold Medal winner in the 2013 U.S. Open Beer Championship, which was named for his inexplicable ability to grow a mustache while he worked for them in 2012. Additionally, Charlie brings a Silver Medal from the 2011 Festival of Barrel Aged Beers to the table. Vice District Owners, Curtis Tarver II and Quintin Cole, couldn’t be happier to bring Davis back to Chicago either. “Quintin and I are excited combine our talents with Charlie’s. Between the three of us, I think you’ll be seeing quite a few unique beers on tap very shortly,” Tarver said. “@HopCast: Vice District Brewing Co. announces head brewmaster – http://t.co/rSbhOvIyGb” my guy Charlie!